Chromosomes are the "blue prints" or "DNA" who make us what we are. Humans normally have 23 pairs of chromosomes - one copy each from their mother and father- making 46 chromosomes altogether. Unfortunately, abnormalities in the number or structure of chromosomes are relatively common. This usually results from unequal division of the chromosomes in the process of making the gametes- the eggs and sperm. Females are born with all of the eggs they will ever have, whereas adult males continually make sperm. This helps explain why some chromosome abnormalities including Down syndrome are associated with "advancing" maternal age, but are not associated- or perhaps only weakly associated- with advancing paternal age (father's age). The aging eggs are more likely to have errors occur during this process of division that results in making the gametes. 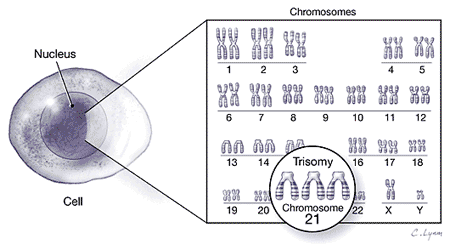 Down syndrome (trisomy 21) results from 3 copies of the 21st chromosome instead of the normal 2 copies, resulting in a total of 47 chromosomes (see illustration below). As noted, this usually results from 2 copies contributed by the mother instead of just 1. There are many other types of chromosomes abnormalities besides trisomy 21. The other 2 major trisomic conditions seen in fetuses are trisomy 13 and trisomy 18. These result from an extra copy of the 13th and 18th chromosome respectively. Birth defects tend to be much more severe with these trisomies and the degree of mental delay is much more profound. As a result, affected fetuses may live to birth but USUALLY don't live much longer. This is especially true for trisomy 13 which is the most severe of the trisomic conditions. Fetuses with trisomy 18 have a wide range of possible abnormalities, and sometimes their abnormalities are not so severe. The ability to detect these fetuses with ultrasound is related t the severity of the defects. For fetuses with few serious defects, the abnormalities are sometimes subtle by ultrasound. That is certainly true for trisomy 21 where relatively "minor" or "nonstructural" abnormalities may be evident. In addition to the three major trisomies, a number of other chromosome abnormalities may occur. Some of these are so severe that the fetus never has a chance to develop and these often result in a first trimester miscarriage. In fact, chromosome abnormalities are the leading cause of miscarriage in the first trimester, regardless of the patient's age. Other types of chromosome abnormalities may be relatively minor and may not affect the individual. These are obviously not important to detect but may show up at the time of genetic amniocentesis. Most chromosome abnormalities affect every cell. However, sometimes the chromosome abnormalities affect only certain cell lines and not the entire individual. Such individuals tend to have fewer and less severe birth defects.